It’s been feeling summery around here, so I say – let’s bring on the colorful food! Lately, I’ve been slightly obsessed with these black rice veggie sushi rolls that are new-ish at (our) Whole Foods. One in particular includes mango, avocado and cucumber and I find myself craving it all the time. I’ve had it on my list to recreate it for you for awhile now, but the idea of rolling sushi has felt too labor intensive. For us, at-home sushi making is “sometimes” food. It’s reserved for those special nights when the sake is flowing and we have nothing but extra time… which doesn’t describe our evenings lately. But this combo was SO good that I thought I’d make it into a more accessible deconstructed bowl version. If you start your rice ahead of time, it’s quick to put together and it keeps well in the fridge. We ate it for dinner last night, I ate it for lunch today, you know the drill…. I get my forbidden black rice in the bulk bins – if you can’t find it, you could just as easily sub in brown rice or another grain. Cook black rice as you would brown rice (I use a rice cooker). Ratio is 1 cup rice to 2 cups water. Pat tofu dry, slice into cubes and toss with drizzle of olive oil and tamari. Arrange on baking sheet and bake until golden brown around the edges. About 20-25 minutes. Remove from oven and toss with a little sriracha to coat the outside of the tofu. While your tofu bakes, mix together the sauce ingredients. (I do this in a jar with a tight lid - shake until combined). Taste and adjust seasonings. 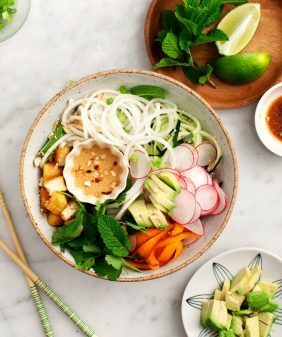 Assemble bowls with mango, scallions, shredded red cabbage, radishes, cucumber, avocado cilantro and tofu. Serve with coconut sauce, extra sriracha and lime slices. Store leftovers in an air tight container in the refrigerator. If you're planning on storing longer than 1 day, keep your avocado separate and dice it as you're ready to eat. (Avocado storage tip: keep sliced-open avocados in a sealed plastic bag with a chunk of onion - it should last 2-3 days). Store sauce separately in the fridge - if it firms up overnight, stir in a little water to thin it out. I love the sound of this combo! I’ve had some black rice in my pantry for a while now, and this might just be the time to use it. I hear you on the sushi making – I love doing it but it’s a once in a while type of thing. Coconut Peanut Sauce YUMMM! Need to make that! That spicy mango really sounds delicious! Love this! That looks healthy, delicious, fresh, beautiful. I can’t wait to give it a try. that looks super refreshing and delicious!! I love this! So bright and fresh. I haven’t seen the black rice sushi rolls at Whole Foods yet but I bet they are stunning. 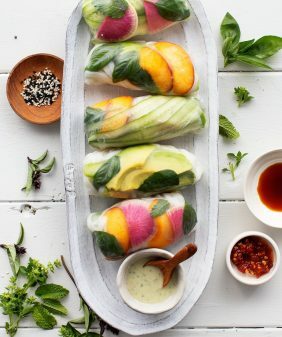 I love how colorful your interpretation of this roll is. 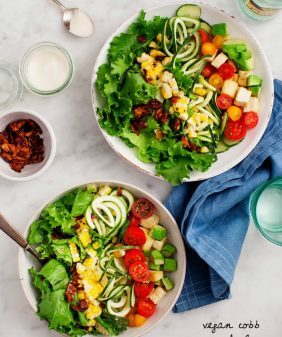 It truly is the perfect springtime salad and I can’t wait to add this to my lunchtime rotation. So bright and refreshing! This looks scrumptious!!! 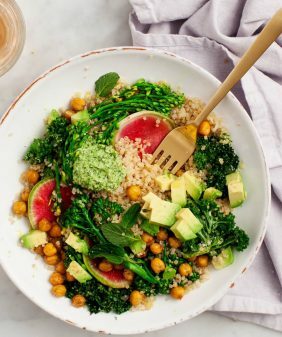 I love mango and avocado together and funnily enough I was looking at a pre-packaged salad when out today and it had a peanut-coconut sauce I was thinking I’d have to recreate! This salad looks spot on. This looks amazing! I love how good you make vegetarian food look! This looks gorgeous! Can’t wait to try it out!! I have just started my own food, cake, reviews and diy blog and I would really appreciate if you could check it out and possibly comment and follow, when I have some more content! That looks fantastic! Love the colors, so lovely! Black rice is such an awesome grain! It looks so pretty with vibrant colored fruits and veggies. 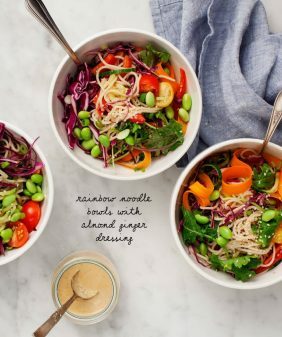 I love every single ingredient in this bowl, but I think the star of the show is definitely the coconut-peanut sauce! I can’t wait to recreate this soon. I’m hoping I can find black rice easily enough–but I’ll take any excuse to make a special trip to Whole Foods! Oh gosh, this bowl is definitely for me. 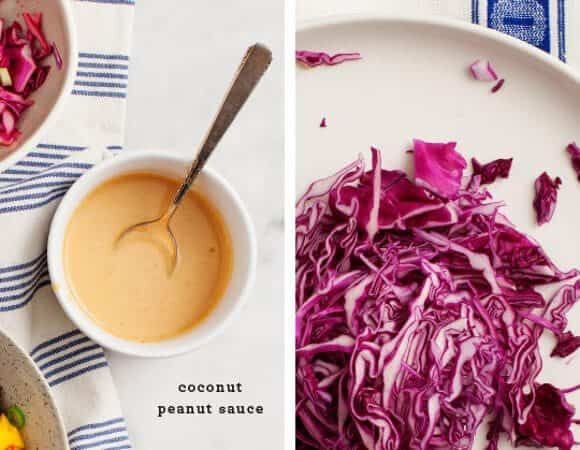 That coconut peanut sauce…..wow! Even though it doesn’t feel like summer here, this brightness is exactly what we need. 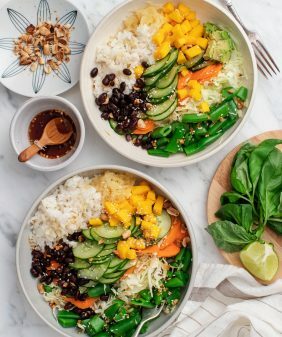 Nothing like a colorful bowl to bring out your appetite! 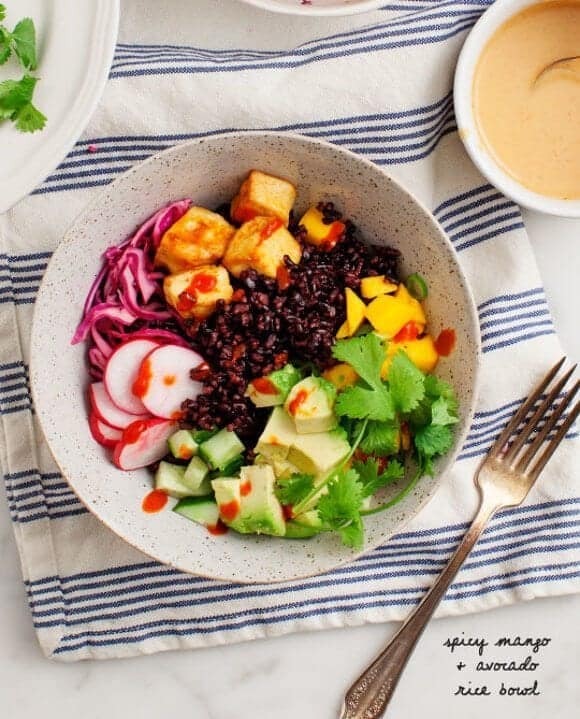 The color combination of avocado, tofu red cabbage and black rice is gorgeous! A serious feast for the eyes! If you’re ever in NYC you have to try Beyond Sushi! They have a couple locations now – one of them is in Chelsea Market. All their sushi is vegan and made on forbidden black rice. So delicious and flavorful. Perfect for mango season! I made this tonight for dinner and used barley instead of forbidden rice (what I had on hand). It was absolutely delicious! Hi Charlotte – I’m so glad you liked! Made this bowl last night and it was creamy, crunchy, sweet, and spicy. So many flavors but they came together seamlessly. Thanks for another simple and delicious recipe perfect for any night of the week! Made these tonight for dinner and OMG..they were phenomenal…my mom and I couldn’t stop talking about how good they were…they are being added to the weekly rotation. Thanks so much for the awesome recipe!!! Hi Molly – I’m so glad to hear this one’s on your weekly rotation, glad you liked! Made this for dinner tonight. It’s my first time cooking tofu in a decade. My family was very suspect – but this was really quite delicious! The flavors blended wonderfully & it looked beautiful. I will definitely be making it again!! I made this for dinner tonight and it was fantastic. So good and something to feel good about. Thanks for the recipe, it’s one for the books! I made this for dinner last night, and it was fantastic! I followed the recipe exactly, except that I substituted some sautéed shrimp for the baked tofu. It was absolutely delicious, and will definitely be going in my dinner repertoire! For someone who has a peanut allergy – do you have a suggestion for an alternative sauce? Hi Jessica, if you can have almonds, replace the peanut butter with almond butter. Made this for dinner last night! It was delicious! I made this recently and it was absolutely delicious. I doubled the recipe for four adults, and we almost finished it off that night. One of my new favorite meals! i’ve made this about ten times already and love it sooooo much. thank you! Recommendation on a rice cooker? This recipe didn’t mention dousing the cabbage in lime juice, but I did it anyway because it as so amazing in the tacos. So glad I did-it rocked my world in this bowl. I did fry the tofu in coconut oil instead of baking it–it’s a healthy fat, right?–but the sriracha made it even better, especially with the peanut sauce. I’ll definitely make this again. heh, I pan-fried the tofu in coconut oil, too 🙂 Delicious! Was delicious but I had some difficulty with the rice! It was still kinda crunchy :/ but I don’t have a rice cooker so maybe that’s the problem. Doin’ it the old-fashioned way! Great recipe! Will definitely make again. Hi Stephanie, I’m glad you enjoyed the bowls! I usually not a fan of tofu ( a texture thing) but this was amazing!! I will never cook tofu another way! The bowl was so good, the sweet and salty and i had forgotten how much I love forbidden rice! Thank you so much for such a great recipe! My husband and I are now fans! This was a wonderful recipe – great tip making the sauce in a mason jar. So much easier to just shake all the ingredients together when it comes to peanut butter. Brilliant! Yay, I’m so glad it was a hit! This is my number one favorite recipe for dinner. I make it at least once a week. Thanks so much! I’m so happy to hear that it’s made it to the regular rotation!